You are here: Home / Newsletters / Newsletters | Thailand / THAILAND | Rev. Jeff Walsh’s article re CHRISTIAN MISSION NARATCHAKWAI and ISAAN people group. THAILAND | Rev. Jeff Walsh’s article re CHRISTIAN MISSION NARATCHAKWAI and ISAAN people group. Thinking in terms of unreached people groups has great value for praying and strategic decision-making. And, though we use such language, let us never forget that unreached people groups are made up of real people whom our Savior longs to welcome with open arms. Ploy and Parn are faithful followers of Jesus and leaders at Christian Mission ban Naratchakwai (CMN) in Northeast Thailand. They are also part of the Isaan people, a large unreached people group. There are 20 million Isaan people, and less than half of one percent are followers of Christ. In addition, God’s Word is just now becoming available in the language of the Isaan people. The New Testament was published in June 2016! In the Old Testament, only the book of Genesis and some other portions are available. For most of us, it is hard to imagine not having the Bible readily available in our own language. Yet Ploy, Parn and others at CMN became followers of Jesus years before the New Testament was published in their own language. We believe, along with other mission organizations, that God is on the move in unprecedented ways among the Isaan people. There are more Isaan Christians today than ever before in human history. The New Testament is being distributed in Isaan cities and villages. Radio stations are broadcasting public readings of the New Testament. Chronological Bible lessons are being developed to ground people in biblical truth and lead them to Christ. Pastors and leaders are being trained. At CMN, our leaders are using English teaching to build relationships and reach the community for Christ. We are grateful and excited to be part of God’s work among the Isaan. Ploy and Parn, besides being key leaders at CMN, are also university students studying English as their major. 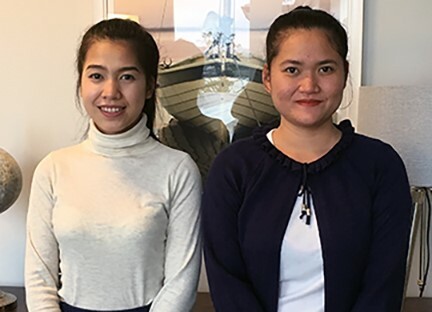 Through the vision and generosity of our Advent Christian mission brothers and sisters in New Zealand (ACMissioNZ), Ploy and Parn are currently on an eight-week English-immersion visit to that beautiful country. I had a chance to speak with Ploy, Parn and Ernie Schache last week. When I asked the young ladies what they like most about New Zealand, they said, “Everything!” Well put.